The battlefield for mankind’s struggle against superbugs has spread from the hospital to the farm. A 60-something pig farmer, his hands swollen, visits Chang Gung Memorial Hospital. At first his symptoms only manifested as skin and soft tissue infection, but his condition progressively worsened until even the bones were infected. Only after turning to the last-resort antibiotic Vancomycin for six weeks did the symptoms get under control. Upon extensive analysis, Dr. Huang Yu-cheng, director of the Child Health Research Center at Linkou Chang Gung Memorial Hospital, discovered that the man had contracted a genetic form of ST9, rarely seen among Methicillin-resistant Staphylococcus aureus (MRSA) infections in Taiwan. Extremely stubborn and resiliant, ST9 can resist a multitude of antibiotics, is largely found on animal husbandry farms, and can be spread to humans. Improper application or excessive use of antibiotics can cause superbugs to grow in an animal’s body. These superbugs can in turn be transmitted to humans via animals, food made from animals, or the environment. The battle against superbugs is of the essence, extending to the agricultural realm, which uses two to three times the volume of antibiotics dispensed to humans. 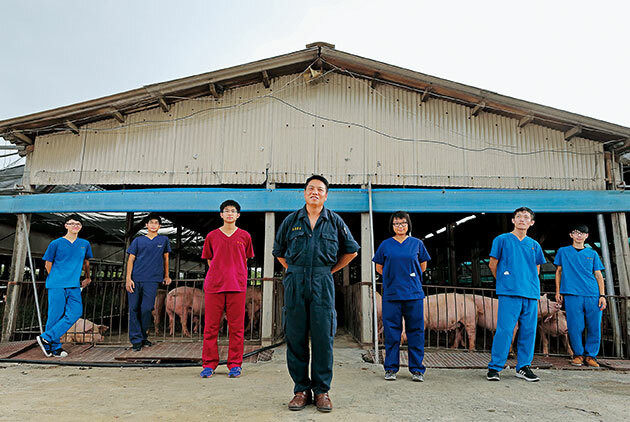 Led by a group of workers spanning three generations, the National Chiayi University Affiliated Yunlin-Chiayi-Tainan Animal Disease Diagnosis Center began operation six years ago. The Yunlin, Chiayi, and Tainan tri-county region accounts for 45 percent of Taiwan’s entire animal husbandry production value. From the transmission of concepts and the precise dispensing of medicine to establishing health monitoring, the center laid the foundation for the critical battle against superbugs. The first step is the dissemination of sound concepts. At 7:00 p.m. on a mid-summer evening, the Yunlin township of Mailiao is eerily quiet, devoid of the characteristic neon lights of most cities. Yet the lights are shining brightly at the Mailiao Farmer’s Association tucked away on a side street. Inside, 50 or 60 second-generation pig farmers, averaging around 35 years old, alternately raise their heads to listen and lower them to take notes. This scene takes place on an almost monthly basis among members of “Swine of Yunlin” -- the Yunlin pig breeders’ book club. From just over a dozen people eight years ago, it now counts 65 members. “By bringing pig farmers together and introducing new concepts, everyone progresses. That’s how this industry can achieve sustainable operation,” remarks an enthusiastic Zhang Yu-cheng, the 33-year-old chairman of the book club. Any topic that could benefit the pig farming industry is incorporated into the book club’s curriculum – covering everything from pig breeds to nutrition, equipment, disease management, and knowledge of medicine. On this day the class is covering infectious gastrointestinal diseases. This is not something to take lightly, as at best it can cause pigs to become weak and short of breath, and at worst makes them sick and die within a short period of time, causing farmers considerable grief. Misdiagnosis, or incorrect application of drugs, not only does nothing to cure illness, but can lead to the growth of a superbug. Kuo Hung-chih, a dark-complexioned man on stage teaching a class in fluent Taiwanese, is an associate professor in the Department of Veterinary Medicine at National Chiayi University. He is also a key member in the Animal Disease Diagnosis Center. Over the course of his two-hour lecture, Kuo repeatedly stresses to the pig farmers the “source management” concept of disease prevention, starting from the environment and feed. Not only can this approach reduce pig losses, it can also lessen instances of antibiotics use. For example, he relates that weaned piglets are susceptible to E. coli infection. “Farmers like to rely on antibiotics to kill germs. However, proper management of feed and environment can reduce the incidence of illnesses,” Kuo says. If a pig gets sick, just as with humans they must conduct an accurate diagnosis, and administer medicine precisely. Last-resort antibiotics are not categorically good medicines; rather, the key is correct administration for the right symptoms. Moreover, medicine must be rotated to prevent the formation of superbugs. The next day, the Center is helping farmers correctly diagnose animal diseases and administer medicine. This is the second step in the fight against antibiotic resistance. It is one appointment number after another in the consulting room, with notations indicating a sick chicken’s symptoms, or which farm the intestines and innards of a diseased pig came from. Veterinarians and vet school students on rotation are busy taking and storing pictures, dissecting, taking biopsies, and sending materials to the lab for testing. Three important members of the Diagnosis Center take care of the more complicated cases. Associate Professor Chen Chiou-lin of National Chiayi University’s veterinary medicine department, who handles avian illnesses; etymology expert Lo Dan-yuan, also an associate professor in the same department; and germ expert Kuo Hung-chih, build a complete diagnosis report following discussion. Beyond treating diseases, the center reaches out to rural areas to conduct health checks and antibody monitoring. Employing scientific data analysis and putting the axiom “an ounce of prevention is better than a pound of cure” into practice has the additional benefit of reducing the need for treatment with antibiotics. This is the third step in preventing the formation of a superbug. The three-step approach made a strong impression on pig farmer Zhang Yu-cheng. Zhang relates that, despite administering vaccinations to his livestock, viruses have run rampant on his farm, so that “out of an average of 25 pigs per pen, we lost one or two.” Attending to over 5,000 pigs at his facility, he gets choked with emotion talking about the period when young pigs could pass away at any time. Once subject to the ravages of viral attack, pigs lose resistance, which in turn opens the door to subsequent germ infection, necessitating the administration of antibiotics. “All of which comes at a cost,” he says. The team at the center helped monitor antibody fluctuations, based on which they suggested that Zhang adjust the timing of vaccine injections. “The pigs got better after the adjustment,” he reports, impressing upon him that “the antibodies’ immunity window is different for each pig farm, making it important to get the timing of vaccinations down,” he adds. From diagnosing illness to health monitoring, it all started to come together six years ago. Professor Chen Chiou-lin admits that establishing a system is tough. But the structure is necessary, not only helping farmers accurately administer or reduce the use of medicine, helping lower costs, but preventing the emergence of a superbug. Students in the Department of Veterinary Medicine of National Chiayi University also form a key force helping to prevent a superbug from wreaking havoc. With the hot sun beating down at three o’clock on a summer afternoon, six students covered from head to toe in quarantine gear enter a pig sty, implements in hand. The students work in concert, one expertly holding a pig weighing several hundred kilograms down, while another swipes its nasal cavity to take a sample. Within half an hour, the group collects biological matter from nearly 20 pigs. In halting Taiwanese, Chen Kuan-yu, a soon-to-be fifth-year veterinary student with thick-rimmed glasses, talks with farmers about the pigs’ current condition. “Only when I arrived on the scene did I realize how much else there is,” he relates, noting how the pig farm environment differs from descriptions in text books, the complex diseases they face, and even the linguistic challenges to overcome. “I watched prime time dramas over the summer break to work on my Taiwanese language skills, taking notes,” he says with a sheepish grin. Going out on call to diagnose the animals not only gives the students practical experience, but also helps cultivate manpower for the animal husbandry industry. Especially given the low percentage of clinical veterinarians in Taiwan’s current animal husbandry economy, an ongoing fight against antibody resistance calls for the introduction of new blood willing to take up the mantle.